AdjustedCostBase.ca has released a new feature that provides a fast and easy way for Canadian investors to import the tax information that impacts adjusted cost base and capital gains for many securities including Exchange Traded Funds (ETFs), Publicly Traded Mutual Funds and Trusts. This feature saves Canadian investors a great amount of time and hassle. It works by automatically importing the capital gains, return of capital, and non-cash distribution information reported by public funds. In a few quick and easy steps, these transactions can be applied to a security in your account. A vast number of funds are covered by this service. The coverage includes exchange traded funds (including ETFs from iShares, Vanguard, BMO, Horizons, PowerShares, First Asset, Purpose and others) as well as publicly traded mutual funds, income trusts and real estate investment trusts (REITs). While this information can be imported manually, it’s a very tedious and error-prone process to research and interpret the tax information, input the transaction one by one, and ensure accuracy. 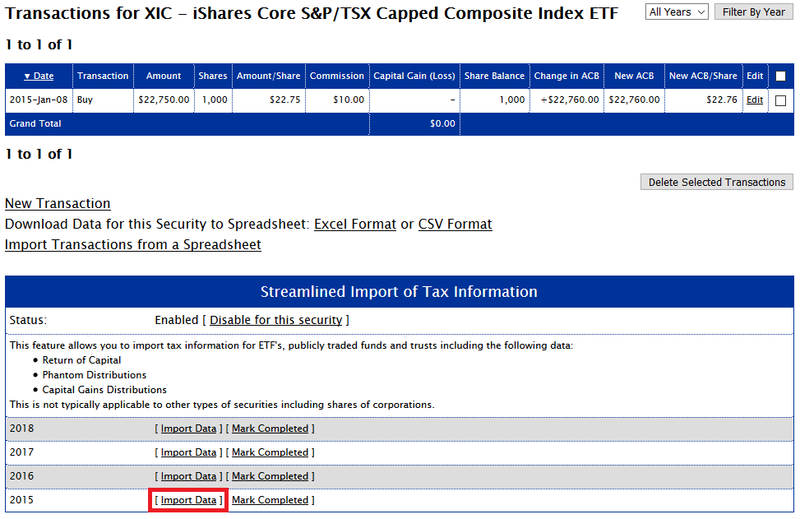 Let’s look at a real-world example involving the iShares Core S&P/TSX Capped Composite Index ETF (ticker symbol XIC). XIC is one of Canada’s largest and most widely-held ETF’s, with over $2 billion in assets. The ACB for XIC is initially $22,760. Let’s assume that no other purchases and sales occurred for XIC in 2015 and that all the distributions were deposited into your account as cash. Even in this case, the ACB can still change as a result of return of capital or non-cash (reinvested) distributions, and indeed that’s what happened with XIC and 2015 (this is a very common occurrence with ETF’s). By searching for the name or ticker symbol for the year in question you can find the ETF. Note that you must still perform a search even if you’ve given your security the correct name. After following the link for the correct security, you’ll be brought to a page that shows all the return of capital, capital gain dividend, and non-cash distributions for XIC for the year. Note: An AdjustedCostBase.ca Premium subscription is required to access the functionality below. However, AdjustedCostBase.ca Basic subscribers can still search for funds, as described above, in order to preview the list of available funds in our datatbase. Only return of capital, capital gain dividends, and non-cash distributions are listed. Your fund may (and in fact most likely did) pay out cash distributions in other forms such as interest income or dividends. The transactions highlighted in yellow are the ones that were added. They include “Return of Capital”, “Capital Gains Dividend” and “Reinvested Capital Gains Distribution” transactions. The most significant transaction is the Reinvested Capital Gains Distribution on December 31st. A Reinvested Capital Gains Distribution (also known as a Phantom Distribution or Non-Cash Distribution) is a reinvestment in a fund that’s usually coupled with a capital gain. The $450.63 in capital gains would be reported in box 21 of you T3 slip that your brokerage sends you. The most interesting aspect of this transaction is the reinvestment component. This amount will typically not be included on your T-slip and as a result many investors fail to factor these transactions into the capital gain calculations. But it’s very much in your best interest not to overlook this. In this example, the reinvestment increases adjusted cost base by the same amount: $450.63. If you were to fail to include the reinvested amount then your calculated capital gain (when you eventually sell the shares) would be $450.63 higher than it should be (effectively, you would be double-paying the taxes on this non-cash distribution). Assuming a marginal tax rate of 50%, you would end up paying an extra $112.66 in taxes ($450.63 x 50% x 50%). And that’s simply from forgetting to factor in non-cash distributions for just a single year and for just 1,000 shares of a single ETF. By taking advantage of this feature, an AdjustedCostBase.ca Premium subscription can easily pay for itself. You will need to initiate the above process for each year you have a share balance for each ETF / fund / trust that you own. This step is necessary to allow you to review the details for correctness. Tax information is added to our database very shortly after each fund reports its tax information for the past year, which typically occurs between early February and mid-March of the following year. If you don’t find tax information for a fund while searching towards the beginning of the year, please check back soon. In your highlighted example, the capital gains dividend should be 0.45926 per share. Also, a general question, why does tracking capital gains dividends matter? It does not affect ACB. Sorry, I meant the capital gains dividend should be 0.45926 per share for December 31, 2015. Nevermind. I realize what the error was now. Please ignore my previous posts. However, I would still appreciate an answer to my question of why tracking capital gains dividends matters. Thanks and sorry for the confusion. You’re correct that capital gains dividends do not affect ACB. They’re taxable immediately and should be reported on your T-slip. 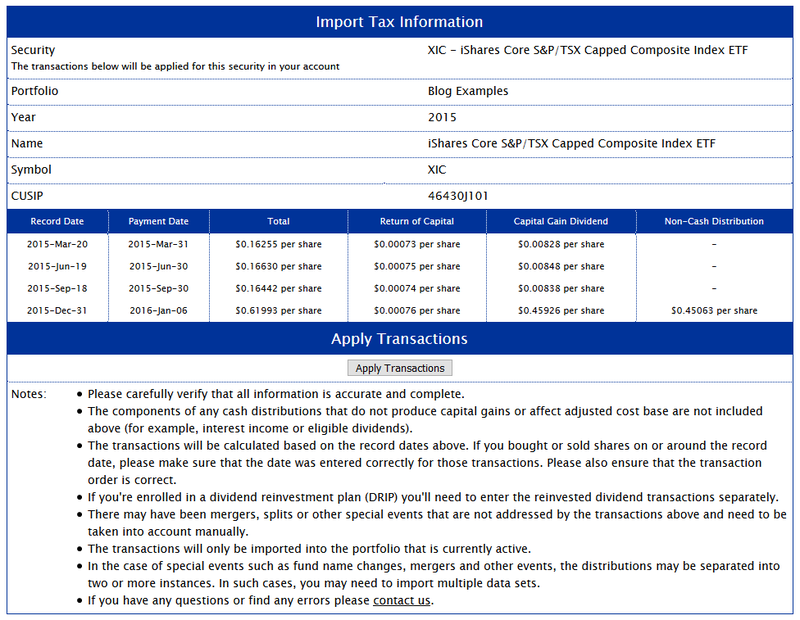 You do not necessarily need to enter these transactions on AdjustedCostBase.ca (although reinvested distributions should at least be inputted as a “Reinvested Dividend” transaction if not a “Reinvested Capital Gains Distribution” transaction). However, this feature is offered for those who would like to see a complete total of all capital gains. AdjustedCostBase.ca will indicate whether or not each capital gain is reportable on a T-slip. I just tried the premium service and I love it!! Thanks!! I’m glad to hear! Thank you for your feedback. This is a great addition to your free service. My question is whether this fee can be deducted as a carrying charge. I understand CRA states you can deduct fees if your income is from business or property. I assume “property” includes investments and since calculating and tracking ACB requires (in my opinion) a great deal of regular accounting, it should be deductible. I would say yes, the fees can be deducted as a carrying charge (line 221), although I’m not completely sure. And in this case the fees are very clearly dedicated towards your investments, whereas more general accounting and tax preparation fees can apply to a wide variety of things. I just signed up for the premium service which looks great! I have used the free service for 2013, 2014 and 2015. I’m thinking about downloading the data for those years, just in case I made an error entering the data manually. If I do that, I guess i should delete all those manual entries first, or would it work to just download the data on top of the manual entries? Thanks. If you automatically import the data for past years, then you would need to delete the manually entered transactions in order to prevent them from being double counted. Is there a similar service for US based ETFs ? For Canadian investors, all distributions from foreign listed stocks are considered to be foreign income. This is the case even if the distribution is considered to be the equivalent of return of capital in the foreign jurisdiction, for example. As a result, only Canadian listed funds are included in the database. Good stuff! I’ve been using your Free service for years, entering my own RoC. Just upgraded to your Premium service, removed my old RoC transactions, and then imported for XIC, since 2009, using the new feature, just as described above. My ACB went up $0.35 as I hadn’t accounted for the reinvested capital gains distributions. I then corrected my handful of other ETFs and saved future capital gains taxes far exceeding the $50 annual fee for the service, even if T2 leaves the inclusion rate at 50%… unlikely. Keep up the great work! Hi, This is a wonderful site and after trying out the free version (recommended by Canadian Couch Potato site) , I had no hesitation to upgrade to the premium version for the extras like the Capital gains PDF report and the ability to import the ROC and other amounts automatically. One question though, I have 2 ETF funds starting from 2016 that are on a DRIP plan and pay monthly Should I enter the DRIP reinvestments per month first before automatically using the streamlined import for ROC and other amounts, or does it matter. The ROC and phantom distribution transactions will be imported as per share amounts, so it won’t matter if you input any other transactions before or after. One thing to watch out for is to ensure that a reinvested distribution transaction occurs after any ROC or phantom distribution transactions that correspond to that same distribution. Further to my question above, and having just tried the service for the first time, I think the best way for checking whether prior years that were done manually are accurate, is to download the data on top of the old manually entered data. Then, as the auto downloaded data is clearly indicated, after checking the two sets of data side by side, delete one set. Thanks, great service! Why are these other cash distributions not included? Is it because they don’t alter the ACB? Easier to track? Reported on T5? I’m considering buying the premium, just want to see if it is really worth it. Components of a distribution that are not return of capital and not phantom/non-cash distributions will not directly effect ACB. The only exception is when a cash distribution is reinvested as a DRIP. Thanks. I have the Vanguard ETF VTI. It is not available in your database. Any chance this may change in the future? Is there another source where I might get this information and manually input it? VIT is unavailable because it’s a US-listed ETF. US-listed ETF’s should not generally make distributions that involve return of capital or phantom distributions, and thus your ACB will be unaffected by distributions. The distributions are normally taxable as foreign income no matter how the distribution might be categorized by US tax law. I’m not sure what post to place this in. How would the ACB be conducted for this US ETF when I’m based in Canada? Can I deduct the “premium” fee just like the trade commission? Edit above – Haven’t purchased ETF in USD funds before and realized that”s just the conversion rate on the CDN dollar to US with a small premium (official at 1.298 for Sept 14th) plus TD’s take. So the ACB would be calculated as normal but just also adding in the factor of currency exchange. Or another way of saying it – a column in a spreadsheet for the exchange rate is added to the buy/sell price when calculating proceeds. I’m totally new to this site, and haven’t yet inputted any information to the basic site, or signed up for the premium service. My question concerns DRIP’s for common Stocks; does the premium service allow for the input of DRIP data and calculate the new ACB. If so, does it do this for both Canadian and US listed Stocks? How far back does your database of tax information go? I’m considering signing up for the premium service but have ETF purchases going back to 2008. Will the premium service be able to populate all of the ROC and Phantom Distributions from that period? Data is available going back to 2007.